Richard O'Barry trained the original dolphin for the hit TV show Flipper back in the 1960s. 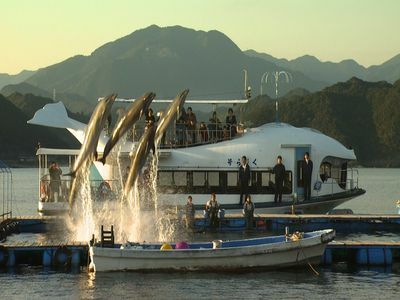 Following the show's popularization of dolphins as smart, human-friendly sea life, dolphinariums and dolphin parks sprang up on the international landscape--to the horrifying detriment of the animals on display. After O'Barry turned a hobby into a highly successful career specialization, the fruits of his labor developed into an exploitative labor trade, victimizing and often harvesting dolphins for staggering profits. Once he realized the steady degeneration of the dolphin trade from an educational enterprise into an industry of cruelty, he not only changed his path, he went from being the world's most famous dolphin trainer to the dolphin trades' most despised activist. Louis Psihoyos, director of The Cove (Exec. Prod. : Jim Clark; Prods. : Fisher Stevens, Paula DuPre Pesman) also lived a double life of sorts. His earlier work as a photographer led him to meet O'Barry, and the type of resourcefulness and adventure-seeking required for his nature photography provided a clear and easy transition for his work on The Cove. Part activist doc and part spy thriller, The Cove (out July 31 in select cities through Roadside Attractions, Lionsgate and Participant Media) doesn't simply demonstrate the high-impact activism of its creators and its subject (O'Barry); it depicts the trajectory of a man who built himself the American Dream, and then, witnessing its consequences, had no other choice but to set about deconstructing the effect of his efforts, from start to finish. this way to sell the subject, or do you feel there's something inherently appropriate about the telling the story of the cove like a spy film? recording all the sounds and radio chatter between the three groups in the cove and when we brought it back to the editors they said, "Jesus! This is like the Ocean's Eleven team." Then we started to say, "OK, but how do we tell the story without putting ourselves in there?" feels like a thriller. It's a hybrid that's resonating with audiences. From the opening line--"I just want to say, we tried to tell this story legally"--I think people are in. You [know you] are going to see something you don't normally see. D: The Cove 's distributor, Roadside Attractions, is kind of avoiding referring to the film as a documentary. LP: The "D" Word, yeah. I think there's a reason for it. People see the film--I got a comment that they "forgot it was a documentary"
D: What do you mean they "forgot" it was a documentary? LP: In the sense that they were trying to figure out what genre it was. It had crossed the line where it had become this hybrid for them. It doesn't feel like a documentary. It bridged this gap. It's somewhere between Delta blues and rock and roll. Where does it cross that line? From Louie Psihoyos' The Cove, which come out July 31 through Roadside Attractions, Liosgate and Participant Media. D: Rick, you mentioned that the Mayor of Taiji, the Japanese city in which the dolphin slave trade and massacres are taking place, once gave you the key to the city. When was this, and in what context? "Jap Whale Killers." Dr. Uyeda gave me this information, so we went to Japan and put together a huge benefit concert called "Celebrate the Whales." The Japanese are very xenophobic, ever since Perry and the black ships went there in 1896 and forced them into trade. They still don't trust outsiders. So when you say "Save the Whales" you draw a line. "Save them from who? From us?" And then you get, "Well, you don't understand us. We do this and you do that." But "Celebrate" the whales? Well, we can do that. We weren't for the boycott. It's a blanket indictment of racism towards the Japanese people. We don't support that and we aren't doing that here. We're isolating the individuals who are causing this problem--isolating them from the rest of Japanese society. And I think this film will do that if it gets before the Japanese people. The Japanese people don't even know this (the dolphin slaughter) is happening. but his excuse not to do it was, "I didn't realize there was so much national pressure from the government not to have this film seen." He also said that he was worried the fishermen there might commit suicide if it was out because they'd lose so much face. D: It would be a minefield for any distributor. Has it been? LP: It's a minefield, but you don't step into the minefield; people will die because of it. It's a huge issue. There's inhumanity to animals happening on an epic scale, but there's also inhumanity to man because people are knowingly eating this toxic dolphin meat and saying everything's OK. If you go to the website for the Japanese Ministry of Health, Welfare and Labor, they have recommendations for pregnant women to eat bottle-nosed dolphin. D: What inroads do you have for distributing in Japan? The Tokyo Film Festival called today. They said that, ironically, the theme of this year's fest is the environment. Not the top director but one of the directors of the fest said it would be hypocritical of us not to show that film. challenge? Could this have come from the inside? illegally by keeping this information from them. thousands of people being poisoned by this meat. Like Rick says, they're not falling over dead, but [Nakami] knows he's instrumental to their health. The minister of health knows that dolphin meat can be anywhere from five to 500 times as toxic as are admissible by their recommendations. He's complicit in this whole thing. RO: It's going to take a tipping point and this film could be that tipping point. the whales sing. How do you feel your film is encouraging audiences to perceive dolphins? RO: We have a utilitarian view of dolphins and of nature and that's something I think the film points out. with whales and dolphins in the wild before, they feel sorry for us. They look at us and see us floundering and seem to say "Poor things. They can't even swim." --For more information on Richard O'Barry's organization or to get involved, please visit http://savejapandolphins.com/. Sara Vizcarrondo is a film journalist writing and editing in San Francisco, California.